I’ve seen this read-a-thon before, but have never really had time to participate. Now I have more time on my hands than I know what to do with – in a good way. 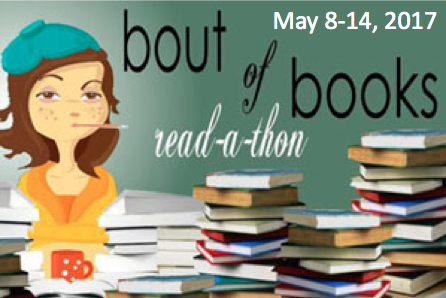 Bout of Books is a one-week read-a-thon beginning Monday, May 8th at 12:01 am (your time zone) and ending Sunday, May 14th. And the best part about it is it’s low-pressure. There are challenges (optional), giveaways, and a grand prize. The Bout of Books read-a-thon is organized by Amanda Shofner and Kelly @ Reading the Paranormal. For all Bout of Books 19 information, updates and of course to sign up and join in the fun, be sure to visit the Bout of Books blog. I know this isn’t part of the Bout of Books sign up, but I thought I’d put it out there anyway. Hopefully, it’ll provide me a smidge more accountability. Just a smidge. For the seven days, my plan is to read the books that are on any one of my challenges (click here to see the challenges) that can be read in a single day or a few hours. By doing this it’ll help me get back on track with my reading goals for the year. Indeed. I noticed that and truthfully some of my favorite novels are pretty dark and dare I say it, depressing.